In order to provide students with an apt learning environment that is practical, KUSOL has invested in a number of initiatives. This includes KUSOL’s state-of-the-art moot court facility whose ambience is impressive. 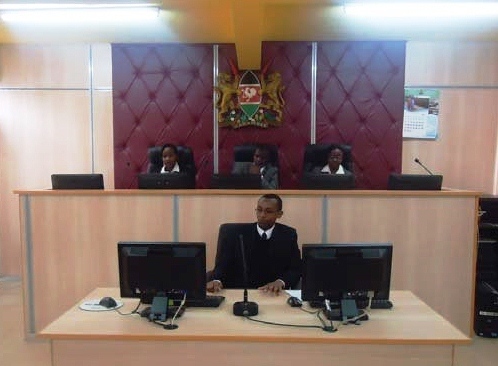 It is situated in KUSOL’s compound and is indeed a great source of pride for the School given its modern features that combine the strong points of the architecture of Kenyan courts as well as others around the world. The moot court is fitted with the latest electronic equipment and uses the latest technologies available for court room practice. The new showcase e-courtroom is fully equipped with electronic evidence management systems, video conferencing facilities, wireless networking and video streaming. The combination of video conferencing and wireless technology allows for external and international networking thus presenting the opportunity to accommodate e-moot competitions involving teams from every corner of the globe participating in their own electronic moot courts. All students will have the opportunity to use this 21st century facility throughout the course of their studies thus ensuring that KUSOL law graduates are able to walk into any courtroom locally, regionally, and internationally and be fully conversant with the technologies and systems employed. The importance of mooting as a method for learning has already been stated previously. The moot court is utilized both for the mooting course offered to fourth year law students as well as by other students who are members of the moot club. Moreover, students who enroll for different moot competitions both in Kenya and abroad can utilize the moot room for preparation.